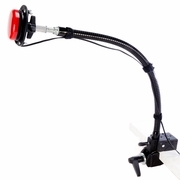 The Gooseneck Mount has a range/reach of 19-in/48-cm and can hold up to 1-lb/0.5-kg. Use the Super Clamp to mount to any surface. The Gooseneck mounting arm allows for easy mounting of any Relax ECU, small AAC devices and switches. All mounting arm connections will fit the Gooseneck. Order online or by phone to choose the appropriate switch Connection and Clamp for your needs.